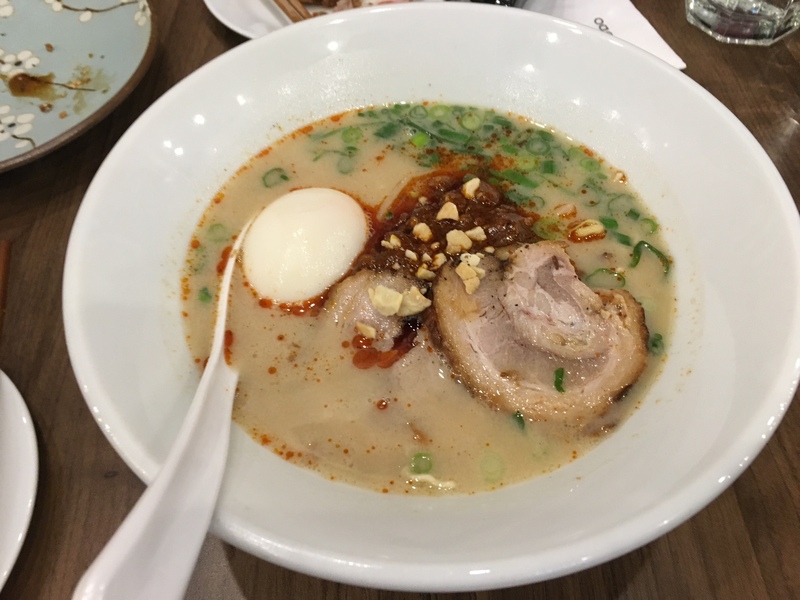 Newly opened Ippudo is hidden in Artemis Lane of QV. It was a little bit tough to find the restaurant – I had full confidence that I’d find it in the common food restaurant area. NOPE! – it’s opposite Meat Fish Wine Restaurant. Shame on me who didn’t google the address! The line was long on a Monday @ 6pm. Not all tables were full and they were starting to open up the outdoor dining area. The line moved quickly after 5 min wait. The staff would walk along the queue and ask for the number of people, whether you’d like to sit outside and whether everyone is present in the queue. If everyone is present, they would fast track you – YAYER! We were recommended to try these wings and they were full of flavour! Pepper and strong sesame smell within the batter. The wings were so crispy on the outside and juicy inside! The dish comes with 3 wings, but we asked to get an additional one to share amongst us girls for additional cost. Unfortunately, one of the wings was undercooked – blood oozing out from the meat once we scratch pass the batter, so we asked for a new one. The staff were so nice in changing it for us. We also dropped a set of chopsticks and serviette and the staff were very friendly in getting us a new one immediately – good service! Most of us ordered Karaka-men with the egg. The broth is creamy tonkotsu broth and is the star of the ramen. The red sauce was the spicy minced pork miso (there’s a non-spicy version if you don’t like spice). I can’t take a lot of spice, but this one was tolerable – I just had a bit of sniffs at the end of it. The pork (cha-shu) is another hit… it is so tender and soft that when I bite into it, it just melts together with the flavour of the broth. Love it! The decor and ambience is clean, modern and spacious. It reminds me of a new library because they set up partitions in twos like a study area (in a good way) I believe this is the culture of any ramen bar in Japan.